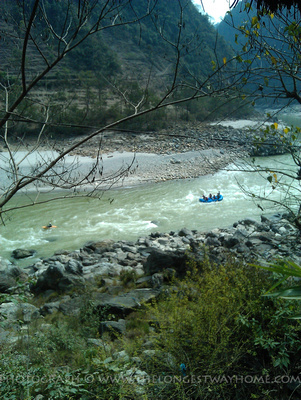 Rafting and kayaking have been popular in Pokhara for well over a decade. Rivaling Kathmandu for a choice of easy to reach rivers Pokhara is a premier location in Nepal for Kayak clinics (learning centers). Kayaking is most popular on the Seti river which offers the best experience. There are also longer haul trips down the Narayani river all the way to Chitwan National Park. The term Kayak clinic is used for lessons in kayaking including how to roll. Nearly every travel agent in Pokhara will offer rafting or kayaking. It's worth your while to seek out the genuine and original operators to reduce your costs. They are listed alongside maps in my guidebook to Pokhara below. Every company in Pokhara will have their own pricing and packages. However here is an example of what to expect. The average cost of rafting in Pokhara is USD $40 per day. This does not always include your equipment eg helmet, life jacket. so do check before booking. An overnight rafting package that includes accommodation and food can cost from USD $140. A four day Kayaking expedition can cost from USD $400 and included meals and accommodation. A four day Kayak clinic (beginner) and cost approx USD $400 and includes accommodation and food. If you plan to Kayak from Pokhara to Chitwan then do find out if the Chitwan National Park entrance fee is included or not. Again do be aware of agencies vs actual operators. Respected agencies include Himalayan Encounters, Paddle Nepal and Adrenaline Rush Nepal. All these and more are listing in my guidebook. Download my guidebooks to Pokhara! Liked this page? You'll love my books! My guidebooks are better than the rest. Yes, really! In them I cover all of the attractions with on the ground well researched information, photographs and travel tested walking tours.